Jaluna Rolik - A weird writer wielding a logic-breaking hammer. Pain can be a horrifying setback, but you can use it to your advantage when your muse feels dry. I find some of my best poetry has been from letting my pain onto paper, and it can be great incentive for writing aggressive moments to torture challenge your characters and help them grow! Even if you don’t give them the same pain in a story, you can think of how they’d react to it compared to you for personal character development, or just use your frustration to give them a situation you were already planning to make them struggle with. Whatever way you choose, remember: writing is more than an art, it’s a lifestyle (and an outlet)! Use your experiences, pain included, to your advantage! I don’t have a working computer yet, but I’m using my time without it to write still. I find it hard to type on my tablet, if I’m being honest- something I basically always am- but even if I have to fight with autocorrect regularly, I won’t just stop writing! There’s lots I can do thanks to apps…and many are free!Today, I’m going to share some of my favorite apps I use when I write, along with some little tricks for using apps not even FOR writing for writing purposes. Please feel free to share your own tips, app preferences and more in the comments! Lore Forge Creator Resources – This app has all sorts of generators in it that you can use offline, from names of places and characters to motives and jobs! Names and jobs have options of modern and fantasy, and places include street names, pubs and more! World Scribe – A great way of planning worlds, World Scribe is a simple app with the ability to put basic information of places, people and organizations in your world. You can also link them, include pictures of them, add snippets about them, and it’s really easy to use! Character Planner – World Scribe is more for simplistic planning, but if you want to go into more details, Character Planner is a a great free way to go in depth for all your characters, and places too! It separates information you can input for each place, character, etc. with prompted information, but you don’t have to answer everything. If you leave a piece blank, it won’t show up in the view of the character sheet when you finish edit mode, and while it includes all sorts of questions for appearance, personality, life, story involvement, relationships and more, you can easily add custom information too! With places, you get prompts for everything from the government and religions to ecology. For when you want to go really in depth, this is a must have to me. MediBang Colors – Although this app is essentially a free mass coloring book, the varieties of line-art and mix of coloring tools makes it great for concept pictures! You can either use line-art from the library included and other people, or you can add some of your own. With bucket, pen, gradient and more, you can easily color the line-art you feel fits a character to be like them for concepts! Here’s one of my recent results as an example. This is a side character for Alien Irony. 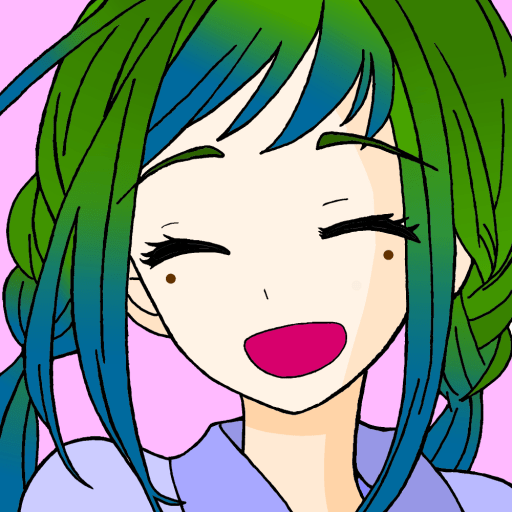 My coloring isn’t as awesome as stuff others share in the MediBang community though. Just browsing is fun sometimes! RPGs – Though my favorite games are from Kemco (I splurge on them a lot when there’s a sale on the play store), RPGs in general are known for their complex storylines and characters, making them great for inspiration. A really creative game I found recently, Light Apprentice, mixes RPG elements and comic books insanely well, and you can play the first chapter free, and incredibly moving! Manga Reader – If you like manga online, you should love this app. You can read online through it’s easy reader from at least seven different manga sites, from MangaFox to MangaHere and more, and it’s a lot like having an online manga library card on your device! You can also download chapters for later, meaning even without internet you can enjoy your favorite scams. It’s search can be by title, author or genre, and if you enjoy a manga you can both add it to your favorites (which doubles as the home screen of it), press “related” for other works from the author and similar stories, and it always saves your place as long as you read the scan consistently on one source. Did your source flake? You don’t have to go from the start- choose what chapter you were on on another site with it and it’ll save your progress there as well. If you add both to your favorites, it’ll appear as two separate entries though. There’s likely many more I haven’t discovered yet, but these are ones I had almost daily, so I wanted to share. If you share your favorites I might just try them and add them to this list! Next time I’ll share ways to use social media for fuel too. That’s all for now though. From my tablet…I wish your stories forever flow and grow! 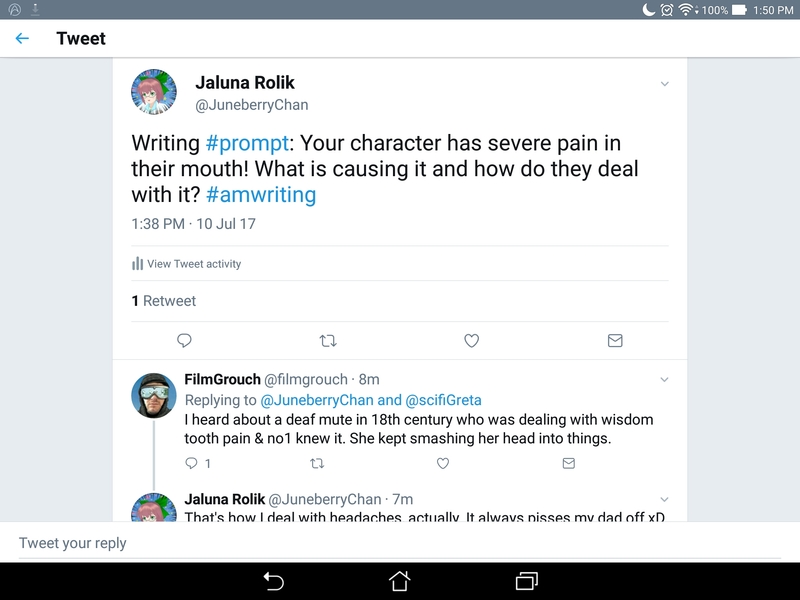 Author JalunaPosted on July 5, 2017 July 5, 2017 Categories Writing, Writing HelpTags Apps, WritingLeave a comment on Even Without A Computer, You Can Write! Likelihood is I will be without a computer until either dad fixes up one of the other dead systems in the house, finds a way around this controller bug, or I break down and buy the cheapest but most useful one I can find. If anyone has a laptop they could donate, I’d totally love to beg for it! I kid…mostly. What does this mean for my blog though? The 101 Challenge is on hold infinitely until I have a computer. My posts will be scarcer. I’ll still be writing and such! Just mostly outline work, maybe some art, etc. My time will be spent mostly fighting tech, playing games, outlining to the max, etc. I’ll share more as I think of it. For now…off to replay Journey to Kreisia to try to find another ending. Normal ending was too depressing! One of the nose guards on my glasses snapped off too. It’s temporarily fixed by replacing it with duct tape. Not the most comfortable, but I can generally see! According to the dictionary, lethologica is “the inability to remember a particular word or name”. Whether you’re writing a story or talking to a friend, it’s a fairly common occurrence, isn’t it? You know you know the word, it’s at the top of your tongue, but your brain just blocks it out. When I first read the word, I really thought it would have to do with death and logic. I mean, letho looks to me like lethal, and logic is literally in the end half of the word! But if I think hard about it, forgetting a word yet feeling like it’s on the tip of your tongue? It really sounds like the death of logic! It feels like my computer has a case of it too, because it hasn’t been running properly the past couple days. As I find it hard to type good posts on my tablet (mixing autocorrect and laziness and awkward typing methods isn’t an easy feat, after all), this will be a two parter: the basics today, and a more detailed thought on this new term plus challenge when the computer lots to listen to me again! Sorry for this, guys. I hope you take your time to keep an eye out for lethologica in your own lives! Feel free to share your experiences and thoughts with me here! Whether it be for wandering streets in reality or the depths of the mind. As children, many of us were taught to use various methods of planning. One such method? Mind maps. However, even for an auditory learner like me, visual maps are somewhat essential. I’ve come to find making even simple maps in Paint just to name the roads in a story’s town handy- and marking off where places are can be a real aid. It’s like making my own (albeit crappy quality) GPS! I’ve also been enjoying mapping in my game development works. In fact, I made a fair few maps recently and taped a playtest of the first couple minutes of the game (which, obviously, is still a work in progress). It showed me there were bugs, but it also made me feel pride for my maps- and my sense of humor. Please feel free to take a look! I’m the type that gets confused easily. My own mind often feels clouded, and I’m often dreading trying to make sense when I speak. For me, I’ve always been better writing my thoughts on paper or the computer rather than speaking them. I know I’m not the only one whose ever felt that way. Do you ever feel like the words coming from your mouth just don’t make the point like they did in your head? Sometimes, even if just for yourself, writing it down can help. Writing helps me with a lot of things, actually. If I’m stuck on a decision, I make a chart sometimes of the good and bad of both sides- sometimes as a Venn Diagram, sometimes as a list, and sometimes just as a stream of consciousness. Whatever helps you strive is a good tool- and mapping the mind is surely good for your heart and sanity (if such a thing exists in you). To be totally honest, I’m still finding and catching up on blogs that fit my niche…And by niche, I mean literally anything and everything. I love blogs about lots of things: about plants, about people’s daily lives, about writing…I even love blogs about blogs sometimes! However, because it’s usually just mild surfing, I don’t honestly pay that much attention. Today’s real challenge is to start paying a better look at the blogs I visit, and keep a closer eye on them! Maybe even nudge me with recommendations or reminders! Wouldn’t it be fun to share? Like a book club for blogs! It’s been a while, but I swear I’m alive! I went a few weeks without internet due to lack of funds and having trouble with a company I was working with to GET internet for my home. The modem they said would take only a few days to a week took at least two or more weeks to get here, and then it wasn’t quite working right brand new out of the package. However, after some great help from a lovely lady at Sprint (my internet is a specialty program for low income, which uses a Sprint cellular modem with unlimited data). We thought it was strange how bad our throughput was, and she agreed, and we figured out the bugs over time. So while originally today was going to be a day to call and complain…It’s working pretty well, now! That said, it’s been a rough month or two. I couldn’t handle living with my grandma after a while and we had a bit of a blow out. We still spend time together sometimes, but we aren’t on the best of terms as of late due to it- but we’re working on patching it up, and dad still helps her from home the best he can. My bruise is gone from my surgery, sadly. Yes, I’m sad about that. I’m weird. But you know what isn’t gone? All the ideas of posts I wanted to make this past month! I’ve been working on various projects at once as usual, and some of it you’ll definitely get to see in future posts. I felt like sharing a list of things I plan to post about in the near future, as well as changes I hope to make on the site (as I get more into the swing of the net again). General updates to my works. A ton of links added to the Sites to See page. I was sure I’d done this one before, but I remembered being on this number, and either way, this is a concept that’s a major deal for most writers….naturally, myself included! And writer’s block isn’t as simple as it may sound, in my opinion. It’s not simply a moment where you don’t feel inspired or hit a plot hole you can’t figure out how to fill (though those are the most common ones for me…) Writer’s block can also have to do with general interest in a project, general energy to work on things, and even can be caused by racing thoughts! Basically…Distraction! When I am working on a story, and I lose my muse for it…It doesn’t mean I’m always losing my way in general. It doesn’t always mean I don’t have any energy to write. It’s often just THAT STORY, for some reason or another. Heck, sometimes it’s just working on a specific chapter! So, I switch gears. Stuck on a chapter? Skip ahead to another one, I can always go back later. Can’t handle this story anymore? Work on a different story, get to know some new characters! Maybe they’ll give you some insight for the previous project you were working on! It doesn’t mean you give up. It just means you switch your mindset! Basically…For me, distraction is a natural helper. Whether it’s switching projects or doing something besides write (play a game for inspiration or to beat up things, watch a movie with family, read a ton of manga…heck, sometimes I do the dishes if i’m irritated by my story!). It helps clean the mindframe that is stuck and irritated by the block, and you’ll manage to find a way around it over time. Time heals all wounds. Writer’s block is part of this…I’m sure of it! Sorry I’m taking so long to update you, guys. I’m headed home from grandma’s finally so I won’t have internet for about a week. I’ll use that time to prepare a good post and clean up at home. I have lots to say, but no time really yet! Hope you lovely people are well! For those who may have forgotten, I was scheduling a procedure a couple weeks ago for my heart condition. As of Thursday, I’m hopefully free of it! The procedure, called an ablation study, involves an electrophysiologist (EP) and a team of others running a thin tube (often called a catheter) and related instruments up the femoral veins from the leg, in this case to go up into the heart. With x-ray mapping and the like, they use this path to find and excite electrical pathways in the heart. Sadly, though sedated, I had to be awake for this part: feeling a harsh pain as they used electricity on me, and at one point even had me quasi-thrashing/convulsing or some other sort of bizarre spasms I can’t fully describe…let’s just say I understood at that moment why they restrained me before starting! I’m about four days post op now, slowly recovering. Though it was a same day procedure, I was so stiff from being restrained even afterwards for four hours (it’s awkward that my dad basically had to feed and gimme liquid because I wasn’t allowed to move while in the recovery room prior to discharge)…I only fully recognized I was post op on Friday. Sure, I ended up with the usual fever, some heart pain (your heart’s gonna hurt when they were electrifying it so often!) and general soreness, but to be honest, the thing I think about most is the giant bruise on my leg. It’s not that it bothers me. Quite the opposite in fact! I took pictures of it for my memory. That bruise is like a battle scar to me. I never want to forget this surgery, because even if I’d put it off for 12 years…I’m so glad it’s finally done. I’ve thought about sharing the picture I took here, but even I know that might be a little awkward. Thank you for being here with me during my journey of recovery! I hope to restart the 101 Challenge from challenge 13 in my next post. Please look forward to it! For those of you unaware, May is Mental Health Awareness month, and Free Comic Book Day was about yesterday. To combine those events at work, I made a short comic that brings up the concept of happiness and sadness, and is meant to give an important message. Something this big should get its own post, right?! You can either read it HERE or, if for some reason that doesn’t work right on your device (it hates my tablet! )…You can try this handy PDF!